Modern convenience and energy efficiency with classic cottage style. 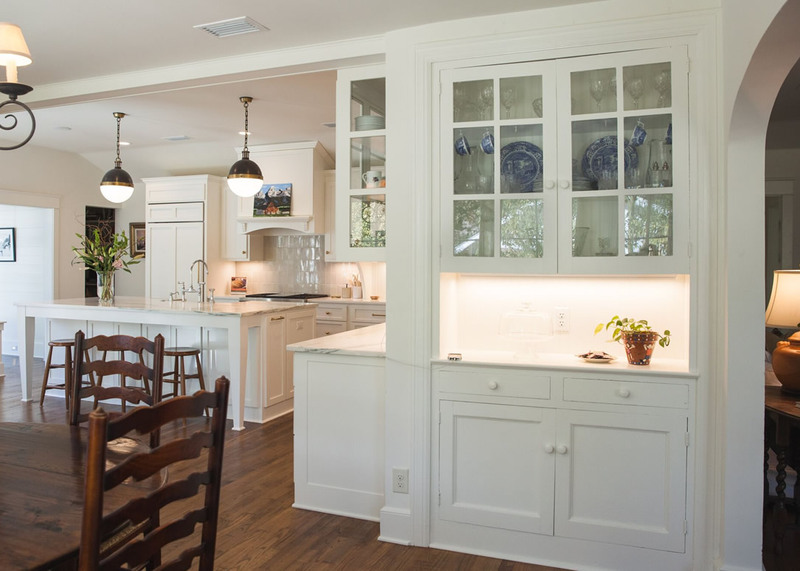 When they first contacted Rebecca Bryant, an architect with WATERSHED, the Fairhope couple was interested in building a new, energy-efficient home on their own lot. Thanks to “divine intervention,” they ended up getting just what they wanted by buying an existing cottage, built in 1938. With Bryant’s help, it was transformed into exactly the light-filled, flexible space they wanted, just blocks from Mobile Bay and from downtown Fairhope. 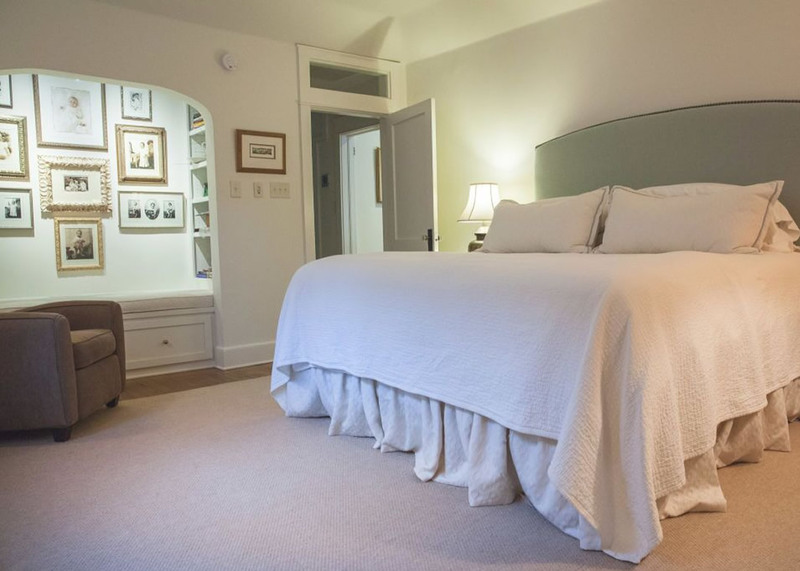 “We were always drawn to cottages,” said the owner of the home, adding that she and her husband moved eight times in the first 11 years of their marriage, before settling in Fairhope—but they’d never owned one. Though they had worked with Bryant on a schematic design for their new home, one day they happened to take a look at a house that had been on the market for a while. 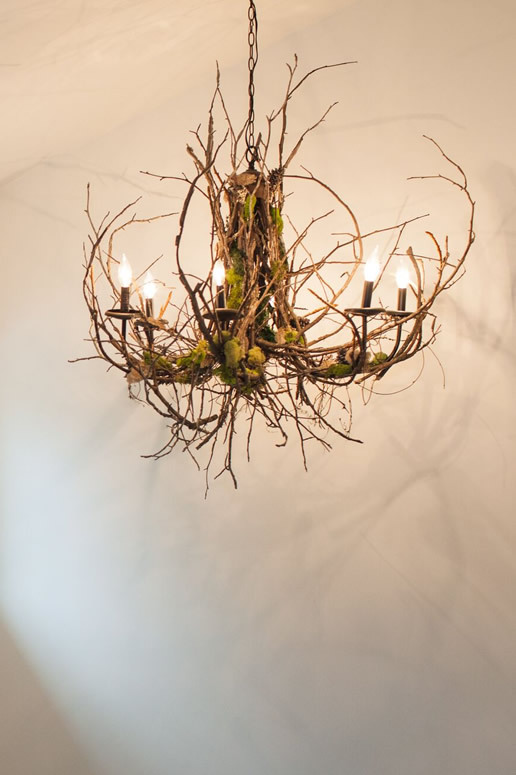 “We walked in the foyer, looked at each other and just knew—the light, the way it was positioned, the old bones,” the homeowner said. They were sold. And so Bryant, who specializes in “green” design, was hired to renovate and add onto the three-bedroom, two-bathroom cottage for the family of five. (To read about Bryant’s own green home in Fairhope, click here.) At that time, WATERSHED was still housed within the offices of WAV Architects, and the project was a collaborative effort. “The greenest thing you can do is preserve a house that’s already here,” Bryant said. As a result of the almost year-long renovation project, the cottage is now 50 percent larger and has a completely new façade—and yet, the homeowners are paying less in utility costs than the renters who lived there previously did. “Looking back at historical bills on the house, we have reduced energy costs per square foot by 60 percent,” Bryant said. To achieve that kind of efficiency, all of the siding was replaced and new insulation added to form a continuous, air-sealed and well-insulated building envelope from attic to crawlspace. The homeowners also replaced all the old windows, electricity and plumbing, and beefed up the structure. The structural upgrades allowed the home to be certified through the Fortified Homes for Safe Living Program, which means it qualifies for significant discounts on insurance rates. The project combines beauty and brains. “It takes more than a ‘makeover’ renovation to modernize a house that was built before air conditioning was in widespread use,” she said. 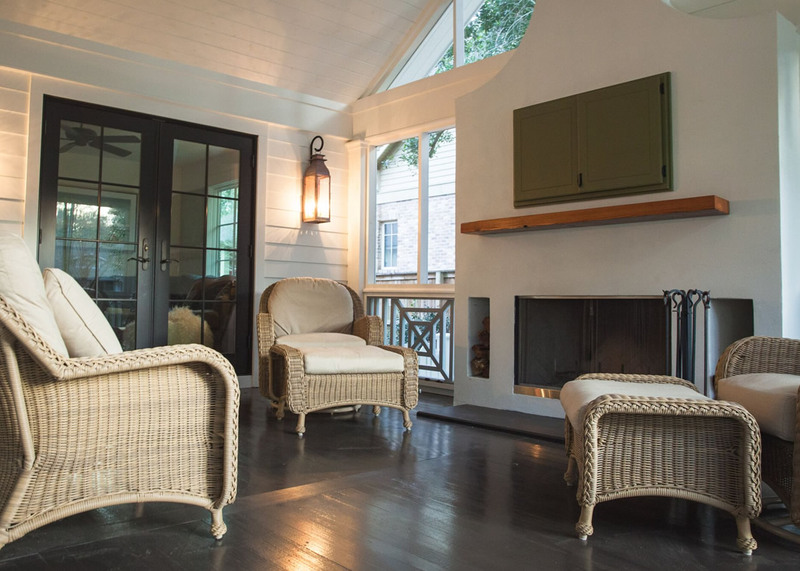 Because it sits on a deep lot, the home could accommodate a large addition in the back while keeping it on a similar scale with the rest of the lush, quiet neighborhood filled with historic Fairhope cottages. While the cottage was somewhat nondescript before, Bryant has given it plenty of cottage charm and curb appeal. 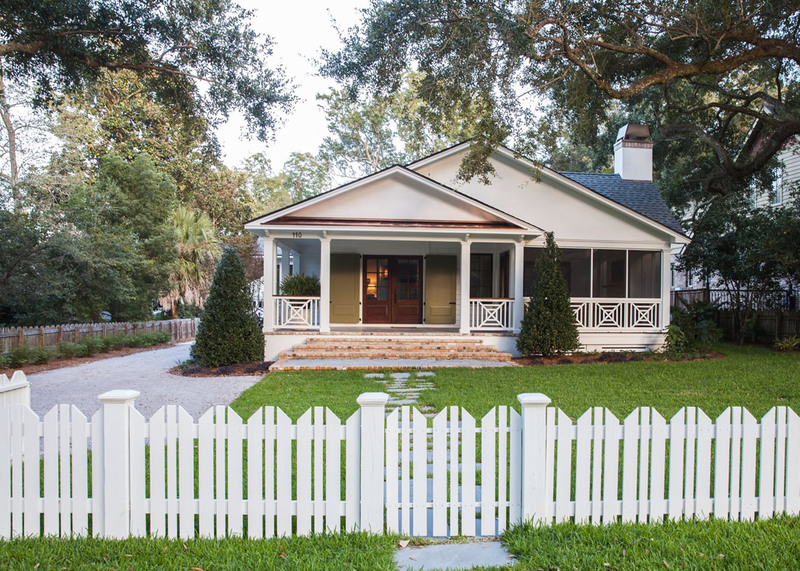 An existing picket fence was reconfigured, and the entryway was completely redone to be more welcoming. Bryant gave the cottage “a new face,” she said, by adding a custom front door flanked by green shutters, “to funnel the eye to the entry.” Gas lamps add to the warm welcome. 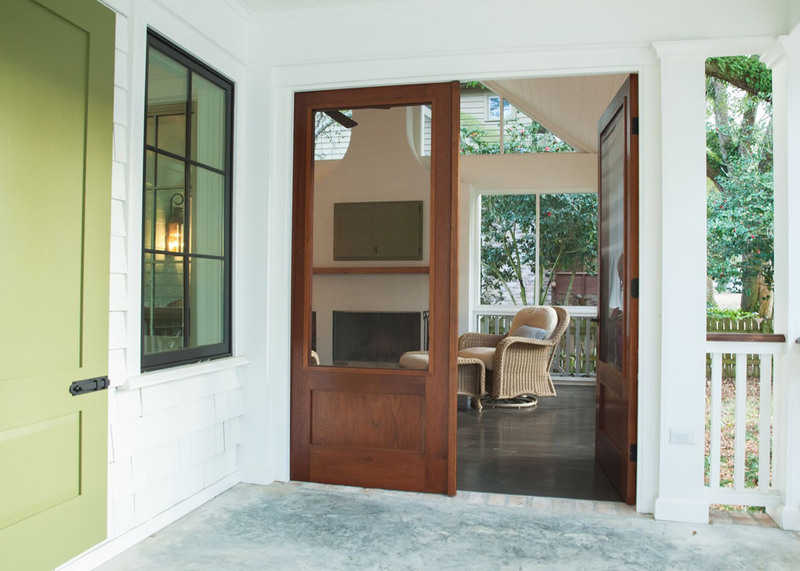 The new front porch opens through double doors with screened panels into a screened porch that runs along the side of the home and is one of the homeowners’ favorite spaces, with comfortable wicker furniture and a TV mounted above an outside fireplace. Screened windows on either side of the chimney “really capture breezes,” Bryant said—and they also provide great views of the fern-covered oak tree in the front yard. “A fun thing about the design was that we had already talked about inside/outside flow, a place for the kids, etc., during the design of the new house. A lot of the same elements ended up in the renovation,” Bryant said. 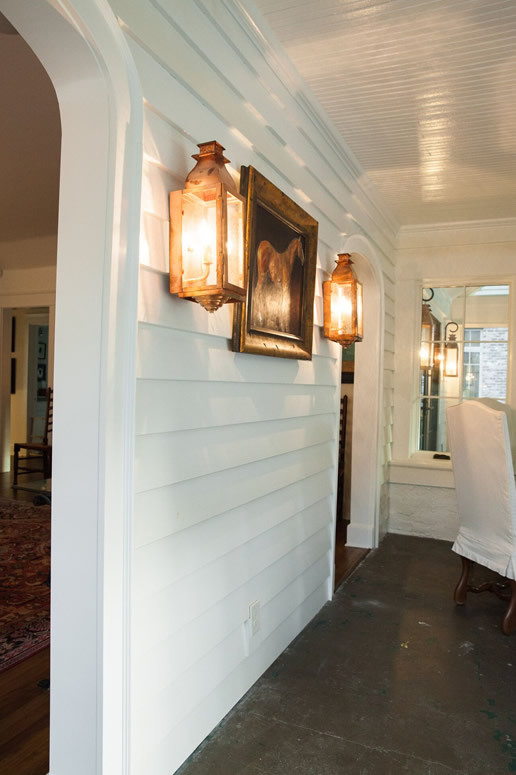 The existing screened porch became an interior entryway, with concrete floors and a pair of custom-designed copper lamps in the middle of two arched doorways into the living room. The arches match an existing archway from the living room into the light-bathed dining room that has a built-in china cabinet. Off the living room, a cozy den opens onto the screened porch. 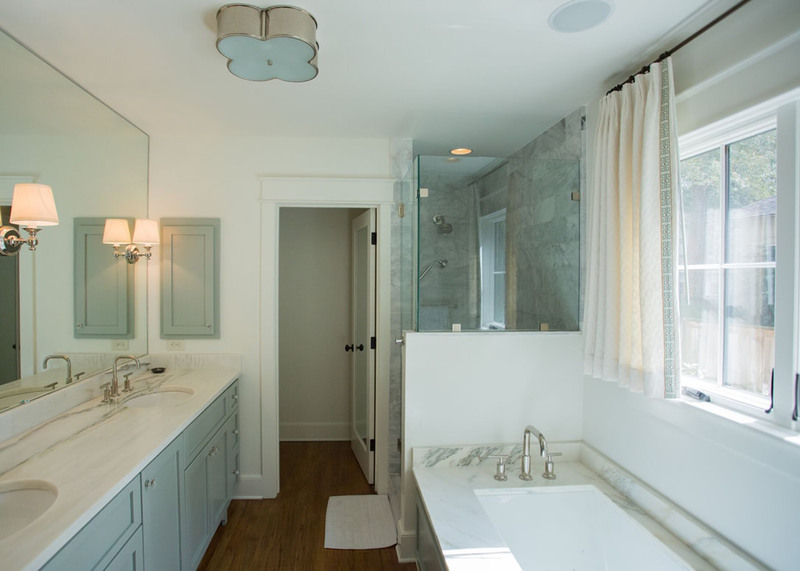 A hallway ends in the master suite, where a closet was turned into a reading nook and a 1950s-era bathroom addition became a hallway with his-and-her closets leading into a serene new bathroom with an Alabama marble countertop and double sinks. 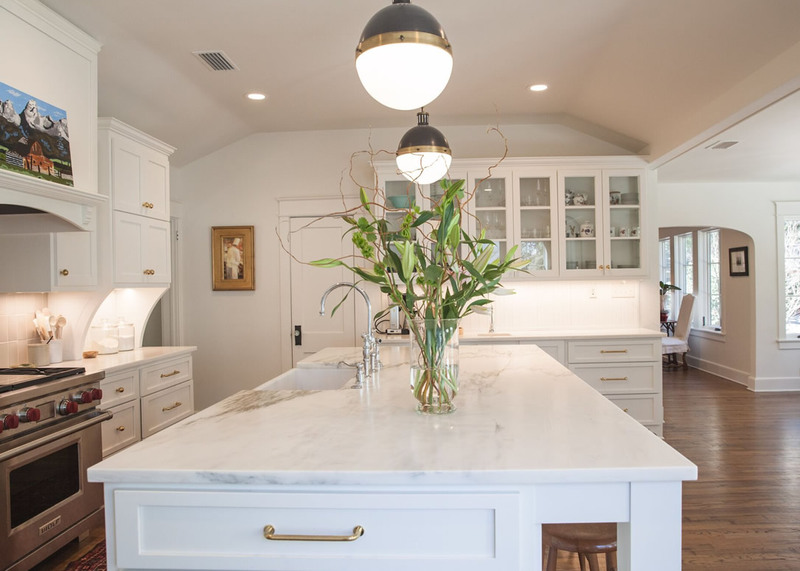 The kitchen, which is literally the heart of the home, was cleverly designed to provide tons of hidden storage space, underneath an Alabama marble-topped island and inside an L-shaped pantry with a butcher block counter. Little touches give it character, from the unlacquered brass knobs to the vertically oriented grey tiles in the backsplash behind the Wolf gas stove to the ledge under the windows. In the new,two-story addition, Bryant mimicked the existing “nooks and crannies,” so that it’s almost impossible to tell where the old house ends and the new one begins. She used transoms over doors and built in storage space beneath the stairs, as well as display shelves, to make the new “kids’ world” area blend seamlessly with the original house. Builder Tom Bierster painstakingly matched the original red-oak floors in the new part of the house. He also built the new cabinets and doors throughout. From the kitchen, a long gallery extends to the addition. A wall of windows provides just the right light to display the homeowners’ family photographs. The windows overlook a new outside terrace area. Just behind that wall, off the kitchen, is “Command Central,” an office/mudroom lined with cabinets and a countertop. The office leads into a laundry room where a clever chute sends dirty laundry from the bathrooms. The homeowners, who have three children, wanted the kids to have their own space now—but in the future, they can practically close it off if they want to. In the new addition, the two girls have beautifully designed bedrooms and their own bathroom at the end of the hall. Upstairs, their teenager has his own bedroom and bathroom with a solar light, as well as a den area, a playroom and a craft room.